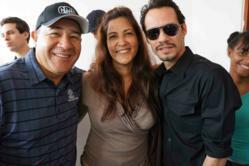 Maestro Cares founders Henry Cardenas (left) and Marc Anthony (right) join Sonia Hane (middle) of Orfanato Niños de Cristo in the Dominican Republic in December 2011.
International pop superstar Marc Anthony and entrepreneur Henry Cardenas announced today the creation of the Maestro Cares Foundation (MC), a non-profit organization established to benefit charitable organizations in developing Latin American countries. Maestro Cares seeks to offer assistance to orphaned and disadvantaged children while supporting social services and other development programs. Initial projects involve assisting in the development of orphanages in Puerto Rico, Colombia, and the Dominican Republic by providing food, school supplies, dorm rooms, classrooms and clinics so that children are surrounded by a healthy environment for learning. By providing children with education, recreation and other development programs within an orphanage, Maestro Cares seeks to instill a culture that includes a strong work ethic, confidence, discipline and hope. The Maestro Cares Foundation will work in association with other organizations to help fund programs that directly improve the well being of children. The first of the orphanages that will benefit from Maestro Cares is Orfanato Niños de Cristo in La Romana in the Dominican Republic, where 40 boys are in need of housing. For more information, visit maestrocares.org. You can also follow Maestro Cares on Twitter @MaestroCares and Facebook (Facebook.com/Maestro Cares). To view photos of Marc Anthony’s visit to the Orfanato Niños de Cristo, visit maestrocares.org. A special account in the name of the Maestro Cares Foundation has been set up to receive donations and individuals will also be able to contribute to Maestro Cares through a series of concerts in 2012 to support the work of the Foundation. Maestro Cares (MC) is a non-for-profit corporation established in November 2011 to support the housing and educational needs of orphaned and underprivileged children in developing Latin American countries. Through contributions of its founders, Henry Cardenas and global artist Marc Anthony, as well as donations from individuals, Maestro Cares provides housing, food, toys, clothing and assists in the academic and recreational development of children through various programs. Marc Anthony has sold over 12 million albums worldwide, making him one of the most influential artists of his time and a true ambassador of Latin music and culture. He has been awarded countless Standard gold and platinum certifications from the Recording Industry Association of America (RIAA). His influence was significantly recognized when he was included in the Top 10 List of influential New Yorkers compiled by New York Magazine. The Miami Dolphins minority owner, who has also established a highly credible acting résumé, was recognized with a Lifetime Achievement Award by the Congressional Hispanic Caucus Institute in Washington D.C. in September 2009. In 2011 he embarked on a world tour and returned to the hit TV series HawthoRNe (TNT) while also launching his new clothing and accessories line at Kohl’s. For more information on Marc Anthony, please visit http://www.marcanthonyonline.com. Henry Cardenas has spent the last 30 years managing and producing some of the biggest live entertainment acts in the U.S. and across Latin America. He co-founded CMN in September 2002 and leads an award-winning team that has orchestrated brand-building consumer campaigns for corporate giants including Anheuser-Busch, Wm. Wrigley Jr. Company, H&R Block, and Verizon, among others. CMN has impacted the event marketing industry by incorporating the passion points of consumers into innovative programs for brands worldwide. Prior to launching CMN, Mr. Cardenas served as President of Cardenas Fernandez & Associates (CFA) for 14 years. He was instrumental in making CFA the largest Hispanic production company of sports, music, and live entertainment events in the U.S. and the Caribbean. In 2010 he signed an unprecedented partnership with the Asociación del Fútbol Argentino (AFA), granting CMN exclusive rights to organize matches for two-time FIFA World Cup Champion Argentina, featuring FIFA Player of the Year Lionel Messi, through June 2014.